Maybe we should change I-5 to "Dry-5"
As I sit here on the Oregon coast with rain looming in the weather forecast, it’s hard to believe that I was in San Jose a little over a week ago, that the sun was shining every day and forecasts of rain were met with laughs because actual rain was so unlikely. I spent 28 days back home helping my father, who broke his hip in late August. Dad, who is amazingly resilient, is healing well. Now we’re back to comparing weather over the phone. Those 700 miles make a big difference. Me: It’s cold. I had to light up the pellet stove and turn on my electric blanket. Dad: It’s hot! 91 degrees right now outside, and about 85 in the house. I’ve got all the fans going. Me: They’re predicting rain here. Dad: Hah. We don’t know what we’re going to do if we don’t get some water pretty soon. Send some down here. Me: I’m trying, I’m trying. I keep telling the rain to go south. Most of my trip between San Jose and South Beach takes place on Interstate 5. It’s a nice wide road with lots of rest stops and plenty of places to eat, sleep or shop. It’s also loaded with trucks and RVs. I keep awake by playing “dodge-truck,” passing the slow-moving 18-wheelers, muttering when they try to pass each other and block all the lanes. Traveling I-5 in the fall, it’s usually hot. But this year, the heat and the drought have had dramatic effects. Fire is a big problem. Watching the news, it seems as if half the state is burning. While I was in San Jose, one of those fires destroyed a large section of Weed. This town of 3,000 at the foot of Mt. Shasta is a place where we have often stopped on our trips.We have stayed in its motels, eaten in its restaurants and walked its streets. The news reports were awful. Homes, schools, and churches destroyed. Was anything left? I had to see. I also had to see Mt. 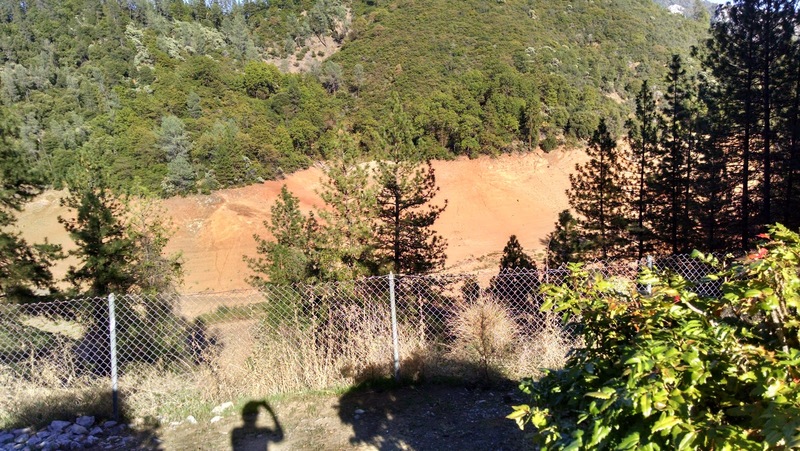 Shasta, where it was reported a glacier at the top was melting, causing a giant mudslide. As I headed north last week, tearful from saying goodbye to my father, the reporter in me was anxious to see what had happened while I was gone. Most of the way, nothing had changed. The hills and fields were brown. The cows still grazed and dozed in the sun. The road was still lined with trucks. It was still hot. Lake Shasta was still nearly empty, vast areas of exposed dirt between the road and the water. Then I rounded a bend after Dunsmuir and there was Mt. Shasta. When I drove south in early September, the mountain was brown, except for a small area of white on the very top. Now it looked like someone had taken a giant knife and spread that white thinly down the sides of the mountain, almost to the base. It had melted like frosting on a cake left in the sun. Then came Weed. I expected to see exits closed and signs covered, but no. I exited and found myself passing the usual restaurants, motels and businesses. Where was the fire? 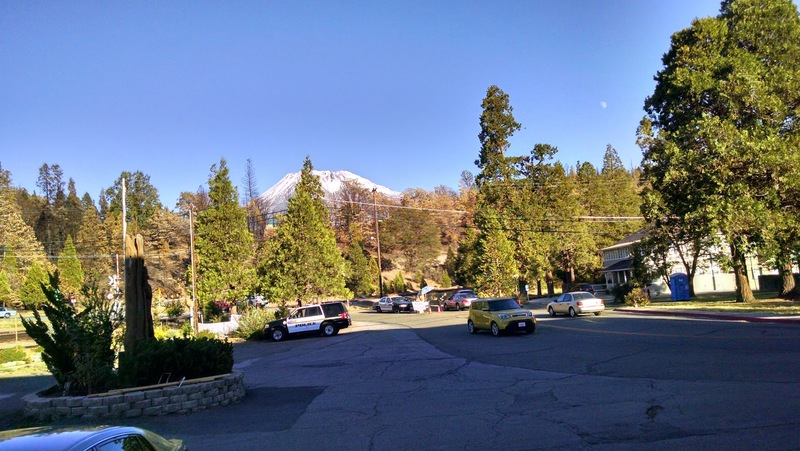 I drove a few miles north before I came upon charred hills and police cars blocking roads leading into the hills. Only residents were being allowed in. About two weeks after the fire, all I could see of what was left was . . . nothing where a whole neighborhood used to be. The ruins had been cleared away. What happened was tragic, 157 homes were destroyed, along with numerous commercial properties, including two churches, the library and part of the lumber mill, but most of Weed was still standing, still in business. They will rebuild. Meanwhile, I needed to drive on. I spent the night in Yreka, the next town up from Weed, exactly halfway on my San Jose-South Beach run. Room 30 at the Best Western Miner’s Inn, dinner at the Purple Plum, a walk through the old gold rush town, some Internet, some TV, some sleep, and back on the road toward home. Once I crossed into Oregon, the landscape turned green and clouds dotted the sky. Go south, I said, go south.